There's not much to say about this book except - Wow! Now, I bought these books for my husband in 2010 and wasn't worried about ever reading them myself, even though he loved them. 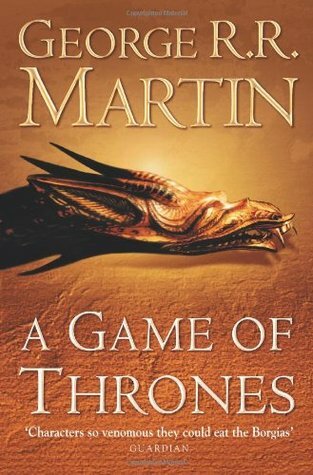 But then last month I got to see the HBO series based on this book for the first time and was completely drawn in by the world and the characters. At that point, I couldn't wait to read the books and this first one certainly does not disappoint. This series is set in a complex world with a huge cast of characters all fighting for power over each other and the realm. I thought the world-building was amazing and the characters are all beautifully fleshed out and realistic. This is a fairly long book, but it never feels it, with great pacing and plenty of action making you oblivious to the page count right from the start. I was impressed how closely the TV series had stuck to the book - even lifting dialogue right from the page. If you are looking for epic fantasy along the lines of Tolkien, with action, adventure and strong characters - plus dragons! - then this is a series you should definitely check out. I am just started the second book now, so I hope to have a review of that for you within the next week or so. I am obsessed with the Game of Thrones series. Are you going to continue? They are all really good. My only advice if you do, is to not fall in love with any characters. As soon as you love them, George kills them. Because he's evil. EVIL. Hi Lindsey. Yes, I am going to read all the others. I should finish book two in the next 2-3 days, so look out for my review of that one soon.